A look at 'the Scrolls' of the Old Testament; Song of Songs, Ruth, Lamentations, Eccelsiastes and Esther. The Song of Songs, Ruth, Lamentations, Ecclesiastes and Esther. These five Old Testament books, traditionally known simply as 'the Scrolls', are among the most neglected parts of the Christian Bible. Each presents particular difficulties with regard to how it relates to the rest of Scripture, and how it should be understood and used as the Word of God for us today. In Judasim, these books were eventually adopted as lectionary readings for give of the major festivals. In Christianity, however, no consensus has emerged about their proper use, or how they address us. Barry Webb gives a Christian interpretation of these problematic writings. Each book is allowed to set its own agenda, and is then examined in relation to the wider Old Testament context and to the New Testament gospel with its basic structure of promise and fulfilment. 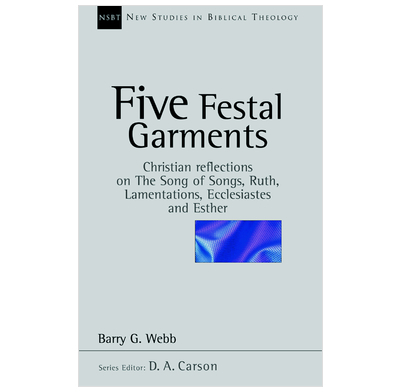 In this way, Dr Webb offers fresh and illuminating perspectives on these 'festal garments' of love, kindness, suffering, vexation and deliverance.